Obituary for Terry William Kenitz | Langeland Family Funeral Homes, Inc. The Reverend Terry William Kenitz was born September 6, 1946 in Detroit, Michigan, the son of Earl and Maurine Kenitz. He was baptized into the Christian faith on October 6, 1946 at Divinity Lutheran Church, Detroit. Terry graduated from Wayne State University in 1969 with a Bachelor's degree in Education. Although trained as a teacher, Terry has many years of experience in the business world, first in management with the K-Mart Corporation and then as Sales Manager for Photo Corporation of America. Terry began studies for the pastoral ministry in the summer of 1986 at Concordia Theological Seminary, Fort Wayne, Indiana. He served as a vicar at Mt. Olive Lutheran Church in Schofield, Wisconsin. On May 18, 1990, Terry received the Master of Divinity degree and was called to Prince of Peace Lutheran Church, Clare, where he was ordained into the Office of the Holy Ministry on June 24, 1990. 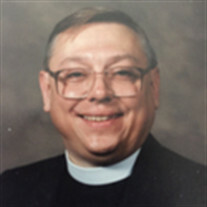 In 1997, he was called to Peace Lutheran Church, Alma, where he served until he received a call to be pastor at Trinity Lutheran Church in Martinsburg, Nebraska. Later he accepted a call to the Good Shepherd Lutheran Church in Middleville, Michigan where he continued to pastor. He was preceded in death by his parents and his wife of seventeen years Wanda Kenitz. Surviving are his son and daughter-in-law Allan and Janice Kenitz and five grandchildren Isaac Kenitz, Elizabeth (Michael) Houseman, Elijah Kenitz, Anna Kenitz and Abraham Kenitz all who live in Kalamazoo, Michigan. A memorial service will be held at 11:00AM on Saturday, April 28th at the Good Shepherd Lutheran Church, 908 W. Main Street, Middleville, Michigan 49333. Memorials in Terry's memory may be directed to the Good Shepherd Lutheran Church.